Cephalanthera austiniae, commonly named snow orchid, grows in the dark, moist forest floor on waxy white stems bearing orchid blossoms that are white or yellowish with yellow centers. Its leaves are rudimentary since they are not needed for collecting sunlight because this orchid lacks chlorophyll for photosynthesis and relies solely on mycorrhizae fungi for food. Snow orchids are extremely rare. They are also noted for their longevity and that they can lie dormant in the soil up to 17 years before blooming again. 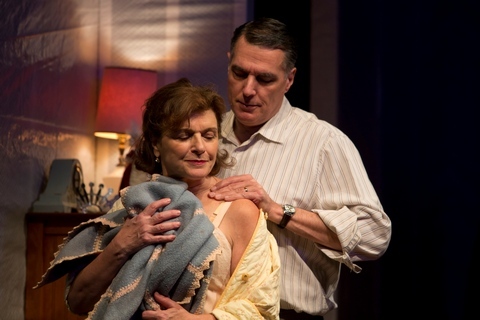 Similarly, the dysfunctional family in the Miranda Theatre Company’s Off-Broadway premiere of the new version of Joe Pintauro’s classic drama, Snow Orchid, endures the deprivation, the lack of love, and abuse from their father. 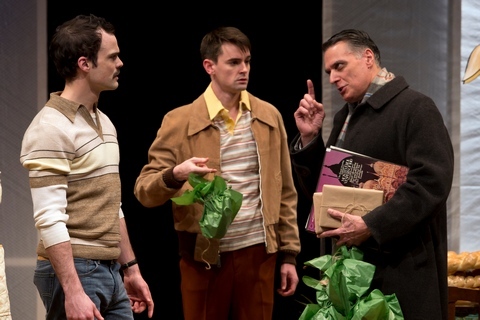 Pintauro’s play about a tragic American family is highly dramatic but lacks nuance. The four main characters are clearly defined in the first fifteen minutes of the play and remain static throughout. The dialogue is unnatural at times and makes for awkward lulls and pauses. As a result, the action becomes monotonous. Rocco Lazarra played by Tony Award-nominee Robert Cuccioli returns home after a year’s absence having suffered a nervous breakdown. He arrives with his arms full of orchids, new life. He opens the shades to breathe life into their existence, but meets with resistance. His battered wife, Filumena (Angelina Fiordellisi), feels trapped by him, dreams of her hometown in Sicily, swears to return, yet hasn’t left the house in years. Their oldest son, Sebbie (Stephen Plunkett), is tortured by the memories of his father’s abuse. He hates him and dreads his return. Filumena depends on Sebbie for her existence and uses him as a substitute for her husband. Blaise (David McElwee), the younger son, a Brooklyn Tech dropout, feels neglected by his family and makes an effort to get to know his father while his mother treats him as a servant and admits that she doesn’t love him. Fiordellisi lights up the stage as the defeated Italian. Her relationship with each character is crisp and fresh. Her performance lures the audience in to taking her side even when her actions are less than savory. Cuccioli is sympathetic as a husband and father trying desperately to prove that he is a changed man, that he is truly sorry. He has some fine moments when he tends to his orchids and tries to become a father to Blaise. In Act Two, he has a powerful scene with Sebbie that they both handle well. Otherwise, he often falls into a soft drone when the scene lacks drama giving way to the lulls mentioned above. Plunkett is believable as the troubled older son. He has some moving moments when the playwright supplies some drama, but in its absence, the performance falls flat. In an underwritten role, McElwee does the best he can with the younger son. Director Valentina Fratti does not use the awkward set well or move the actors around it in a natural fashion. The actors are confined to tight spaces that give the sense they are acting in straightjackets. Nor Fratti does not help the actors to lift them out of the repetitiousness of the script. The set by Patrick Rizzotti is unimaginative and the weak link in this production. There is little or no indication that this is an Italian household. New unpainted white muslin is used to establish the outer walls of the house. The muslin is wrinkled. Is that supposed to represent an unkempt house? Everything else is in its place and clean. Is it supposed to affect the appearance of old and frayed? It looks brand spanking new if so. The worse aspect of the set is that it divides an already small stage into four quadrants each containing a piece of furniture that utilizes most of the space and leaving little room for actors. The first scene of the play is at the dining room table. The table is not needed afterwards, yet 25% of the stage is taken up by that table for the duration of the play while love and fight scenes take place in their tight little quadrants. The lighting by Travis McHale is almost unnoticed, yet clearly marks the boundaries of each scene where the set doesn’t. The sound design and original music by Quentin Chiappetta help evoke an Italian feel while aiding the momentum of the play. For the record, Snow Orchid was produced in New York City by the Circle Repertory Theatre in the 1980’s, starring Peter Boyle, Olympia Dukakis and Robert LuPone. This new version of Snow Orchid produced by Miranda Theatre Company is poorly staged while putting all its hopes on the actors to the color.